Andy Robertson hailed the performance of Fabinho as ‘different class’ after he produced a fine display in the unfamiliar position of centre-back at Brighton & Hove Albion on Saturday. With Dejan Lovren and Joe Gomez ruled out of the trip to the Amex Stadium due to injury, and Joel Matip still working his way back to full fitness, Liverpool were left with Virgil van Dijk as their only fit senior central defender. 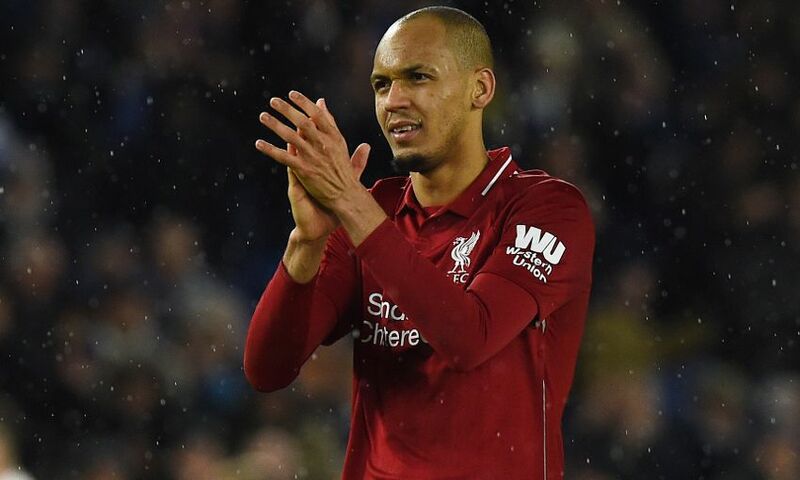 However, as at Wolverhampton Wanderers in the FA Cup tie earlier in the week, Jürgen Klopp elected to deploy Fabinho in the position – and the manager’s faith was rewarded with a solid outing. Indeed, the Brazil international produced one of the game’s key moments to help the Reds to the vital 1-0 win as he blocked a goal-bound Pascal Gross shot inside the box. “For somebody playing out of position, he covered so well, he cleared away and had so many good blocks,” Robertson reflected. Much like Robertson last season, Fabinho was gradually introduced into Liverpool’s starting line-up following his summer transfer from AS Monaco. Since the beginning of December, the No.3 has started seven of the Reds’ 11 matches in all competitions, having made just five prior to the clash with Everton on December 2. “I think all the lads that have come in have experienced very similar,” said Robertson. “Me and Chambo [Oxlade-Chamberlain] experienced it last season. Naby [Keita] is experiencing it a wee bit now, Fabinho has experienced it, Shaq [Shaqiri] has experienced it. “It’s just learning and of course the massive expectations that come with playing for Liverpool sometimes takes a wee bit of getting used to. It did for me and once I got used to it I’ve not really looked back. Victory over Brighton helped Liverpool move seven points clear at the top of the Premier League table, with Manchester City not in action until they take on Wolves on Monday night. It also meant the Reds returned to winning ways following 2-1 reversals at both City and Wolves in league and cup. Robertson said: “The lads dusted themselves down after a very busy Christmas period and we go through it again. “We go through most of the fixtures again and luckily we don’t have to play Man City again because they are a very good team. “We did well against City but they took the chance at a crucial point. It could have gone either way but they got the win that was vital for them. I don’t think we played badly and a draw would have been fair result. “People can overreact when you go that long without the first defeat but we all stayed calm, we knew what we had to do. Despite Liverpool opening up a seven-point lead at the summit, Robertson is keen to echo the sentiments of Klopp and Jordan Henderson in insisting no-one within the dressing room was paying too much attention to their position at the moment. “Look, we hope we are here to stay,” stated the Scot. “That’s the main objective, keep winning games and keep on top because that’s where we are right now. “We know it’s going to go right down to the wire. There are still a lot of big games to come and we'll just keep knocking them off. “Coming to Brighton is a very hard game and we’ve got that out of the way now. The two games against Brighton this season have been massive for us because we have not been at our best. “When we played them at home they probably had a few more chances than they had here and we won 1-0. Now we have done the exact same away. “It was a struggle, especially in the first half, but second half we started really well. We got in front and after that we looked really comfortable and didn’t look like we were going to concede. “It’s just the winning mentality and finding a way to win, and that’s what we did. “Whoever wins the league will probably have three or four games to look back on and think 'we weren't at our best but that was a big win', and if we do it then I’m sure we’ll look back on this game as one of them. “The only pressure for us is playing for Liverpool - that’s enough pressure. And we can deal with that.